Have you sometimes noticed the screen tips, i.e. small pop-up windows, that appear on Websites when you hover the mouse over a text or a picture? ​Have you been looking for at way to make such screen tips in Word? DocTools ScreenTipManager makes it fast and easy to create and edit screen tips in Word with up to 2040 characters. You will also find unique features for formatting and handling the screen tips. You can use screen tips for different purposes such as instructions or definitions. 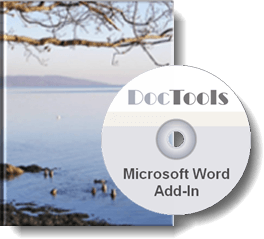 DocTools ScreenTipManager works with Word 2010, Word 2013, Word 2016, Word 2019, Word for Office 365 on PC. Watch the short videos below and read on to learn how DocTools ScreenTipManager can help you. Single user license only EUR 47 - volume discount - see Pricing details below. 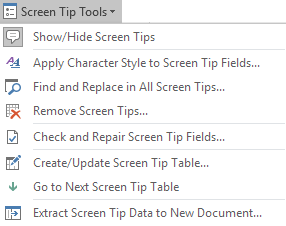 DocTools ScreenTipManager lets you add as many screen tips you want in a Word document. Screen tips will only appear in Word. Screen tips will appear in Word even in protected documents such as forms. Screen tips will not appear in e.g. PDF format. DocTools ScreenTipManager lets you quickly create a table with all your screen tips, either in the same document or in a new document. For example, this makes it easy to reuse screen tip texts across documents. The user interface (i.e. screen texts in the Ribbon, dialog boxes, help, etc.) of DocTools ScreenTipManager is in English but the add-in can be used with any language version of Word. DocTools ScreenTipManager is easy to use. You can start using it immediately but it is recommended to spend some time on familiarizing with the functionality in order to take full advantage of all the features. You will find more details about the screen tip features below, including a video that shows DocTools ScreenTipManager in action. Over time, many users have asked whether it is possible to create screen tips in Word, i.e. small windows that pop up when hovering the mouse pointer over a text. Word has no feature especially aimed at this but it is possible to tweak Word features to make screen tips anyway. Since 2011, I have provided information and a free macro solution for creating screen tips, available from the Macros menu at my website www.thedoctools.com. That solution lets you create screen tips including max. 256 characters. I know from the feedback that this macro solution has helped many users. With DocTools ScreenTipManager you can do much more than that. Not only can you create screen tips with up to 2040 characters - the add-in includes a number of other features. See below for details and watch the video. You have access to the functionality of the add-in via the Screen Tips group in the DocTools tab in the Ribbon. You will find a short description of each command in Overview of all features in ScreenTipManager below. If you hover the mouse over a command, you will see a short description of the command. When you select a command that opens a dialog box, the dialog box will show information about what to do. In addition, the Help on DocTools ScreenTipManager command in the Help menu provides comprehensive help. All you need to do to insert a screen tip is to position the insertion point where you want the screen tip text to appear and select Create/Edit Screen Tip. TIP: You can also open the Create/Edit Screen Tip dialog box using the keyboard shortcut Alt+F12. Watch the video below to learn how it works. Opens a dialog box that lets you create a new or edit an existing screen tip field. To create a new screen tip field, position the insertion point where the screen tip field is to be inserted or select text that is to be used as the display text. If you have selected text before you open the dialog box, that text will automatically be suggested as the text to display in the document. If no text is selected, you can enter the display text in the dialog box that opens. The Check Spelling button in the dialog box lets you check the spelling and grammar of the screen tip text. To edit an existing screen tip field, click in the field before selecting this command. Goes to the next screen tip field in the current story, if any. Click repeatedly to browse through screen tip fields. Goes to the previous screen tip field in the current story, if any. Click repeatedly to browse through screen tip fields. You can see an illustration of the Screen Tip Tools menu above the video. This command toggles display of screen tips on or off. To see screen tips when hovering the mouse pointer over a screen tip field, the display of screen tips must be on. This command lets you select a character style that will be applied to all screen tip fields in the document or to selected screen tip fields only. You can use the command to make sure that all screen tip fields are formatted the same way. For example, it may be useful applying a special character style, e.g. with background shading that makes it easy to distinguish screen tip fields from other content in order to help the user. The command also lets you remove all character formatting, applied via a character style or as direct formatting, so that the screen tips revert to the underlying paragraph style. This command lets you find and replace text in all screen tips in one quick operation, without editing the screen tips one by one. This command will remove screen tips and convert screen tip fields to normal text. You can select from removing all screen tips in the document or only selected screen tips. You can also select whether or not to remove the special style of the screen tips display text, if any. This command lets you check the entire document for problems with screen tip fields and lets you correct the errors, if any. Possible problems will be found one by one in order for you to handle them individually. This command creates a table in the cursor position in the active document. The table will include data for each screen tip field. You can define which data to include in the table and whether or not to combine data for identical screen tips in a single row. You can include the display text and screen tip text for each screen tip field plus additional information. If a screen tip table already exists, you will be offered the option to replace that table with an updated version. In case of a new screen tip table, the insertion point must be in an empty paragraph where the screen tip table is to be inserted. In case of updating an existing screen tip table, that table will automatically be found. The command will remember your latest screen tip table settings for each document. Goes to the next screen tip table in the main text story, if any. Click repeatedly to browse through screen tip tables if more tables are found. This command extracts screen tip data from the active document to a new document. The data will be listed in a table in the extract document. You can define which data to include in the table and whether or not to combine data for identical screen tips in a single row. You can include the display text or the entire screen tip field plus the screen tip text for each screen tip field plus additional information about each screen tip field. The command will remember your latest screen tip extract settings for each document.